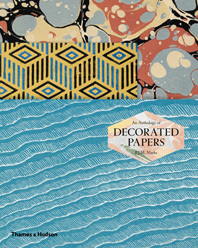 Papercrafting has just gotten more elegant, more exciting and much richer and more dignified with the stunning An Anthology of Decorated Papers (Thames & Hudson, $60). P.J.M. Marks, P. J. M. Marks, curator of bookbindings at the British Library, has pulled together a collection of gorgeously reproduced decorated papers, along with a thoughtful and carefully researched history of this often-overlooked art. Rich in ornamentation, decorated papers have been in use for centuries—as wrappers and endpapers for books, as the backing for playing cards, and even as linings for chests and cases. Yet despite the many contexts in which they can be found, they often go unnoticed. The remarkable new book An Anthology of Decorated Papers not only showcases several hundred of the best and most exquisite examples of decorated paper, but also provides a fascinating introduction to its history, traditions and techniques. “Decorated papers have been produced worldwide for centuries,” Marks writes in the introduction to the book. From rudimentary paper in the Chinese court in 105 AD to block printing in China and Japan in the ninth and seventeenth centuries, respectively, to pre-industrial European decorated papers in Germany, France and Italy, to the impact of decorated papers, including Benjamin Franklin’s introduction of bank notes printed marbled paper to counter fraud, Marks examines the many paths and uses of decorated paper throughout history, including in art, bookbinding, and stationery. Drawing on the Olga Hirsch collection at the British Library, one of the largest and most diverse collections of decorated papers in the world, this beautifully produced anthology will both delight and inspire designers, bibliophiles, and anyone with a love of pattern and decoration.